The most common form of damage to a home is wind and hail. Texas ranks #1 in hail alley with over a million properties affected by hail damage each year. The Texas Department of Insurance incentivize homeowners to invest in stronger roofs that resist damage from storms, especially when the average cost for a new roof is $4,900 – $14,100. The third factor holds the most weight when determining your discount. Materials are ranked using the UL test standard 2218. All roofs fall in a classification between 1 – 4 with 4 being the strongest. To test the strength of the roof, professional testers drop steel balls of increasing size on the roofing materials to see what type of damage the shingles can withstand. To pass the test, the material must not tear or be dented from the impact. The higher the classification, the better the discount. Expect discounts up to 35% if you can meet Class 4! Here are the most common types of roofing materials and how they rank, as well as their average useful life. Most roofing materials can range from Class 1-4 on the impact scale above based on the quality of the material installed. This is the most common type of roofing you’ll find on most American homes. They’re affordable, easy to install, and have an average lifespan of over 20 years. Because you can get various types of asphalt shingles, they range between a 1-4 on the impact scale with the more expensive ones offering better protection. These types of shingles are better at reflecting wind than hail. They can hold up against 125 mph winds but aren’t the best against high impact damage. However, they’re long-lasting with an average lifespan of up to 100 years. These types of shingles are similar to clay, but shorter lifespan. They have an average lifespan of 50 years. This is an eco-friendly roofing option because these shingles are cut directly from rock. They hold up well to the wind like clay tiles, however, impacts can create chipping and cracking. The other downside is that they’re very expensive. But, they offer a long lifespan of up to 100 years. Metal shingles are affordable and one of the most durable roofing options available, especially when it comes to wind. Whether metal shingles or panels, you’ll have a barrier between you and powerful storms. Their sleek surfaces are also great for repelling water and snow, making them ideal for wetter climates. Usually metal roofs have a lifespan of 40 years. These durable and affordable roofing covers are common on townhomes and rowhomes. They’re usually made out of recycled rubber, reducing waste while guarding well against water. They have a lifespan of 40 years. Plastic shingles are great at imitating other types of roofing and can vary in durability based on the material. Some plastic shingles tend to crack and fade in intense heat. Others are made specifically to reduce wind and hail damage from hurricanes. Like asphalt shingles, quality can vary. They have a lifespan of 20-40 years. Wood shingles are one of the cheaper options, but where you save on cost, you lose on durability. They’re not ideal against wind and should be used in areas with milder climates. One positive is that they’re environmentally friendly and can be easily recycled when they’re past their lifespan. 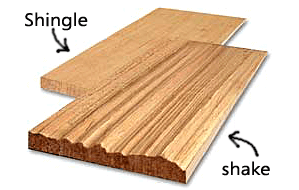 They have a lifespan of 20-40 years for wood shake and 30-40 years for wood shingle. Solar tiles are perhaps the most expensive type of roofing you can have for your home. These shingles look similar to other types of tiles, either asphalt or tile, but work like solar panels. They’re great at resisting wind and hail. And with tax rebates and lower energy bills, there are plenty of ROI positive incentives for choosing solar tiles for your home. They are guaranteed for the life of the home. No matter what roof you choose, know that it will have a LARGE impact on what you pay for homeowners insurance. The roof is the most important part of the home in the eyes of the carrier as roof claims are very common. Expect your roof to be the key driver of price.